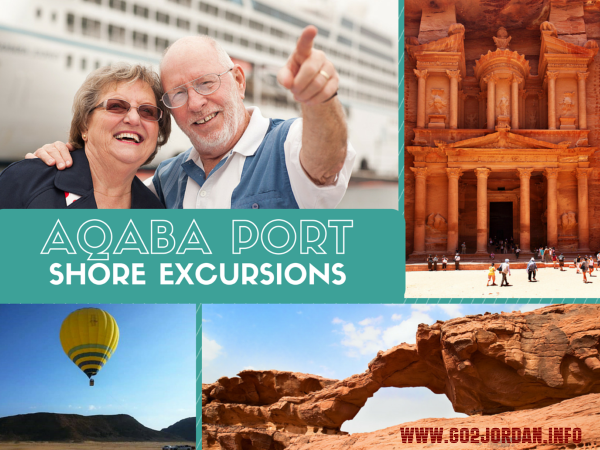 Port of Call: Aqaba, Jordan. You are only here for 8-12 hours and you want to make sure your time and money are well spent, right? Fair enough. 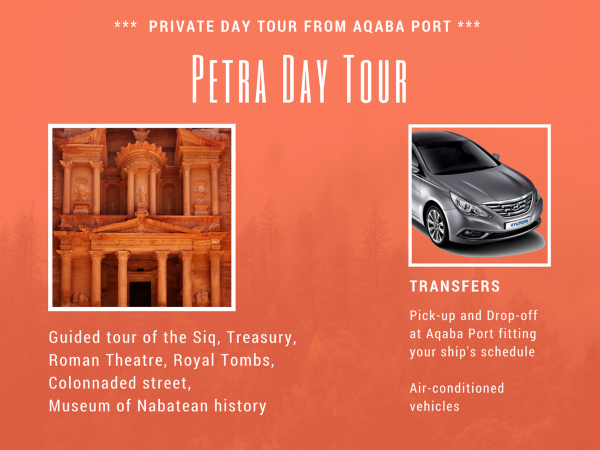 So, are you searching for private guided Petra tours from Aqaba port because you don't want to be herded like sheep, together with hundreds of other tourists, from one place to another? You came to the right page. 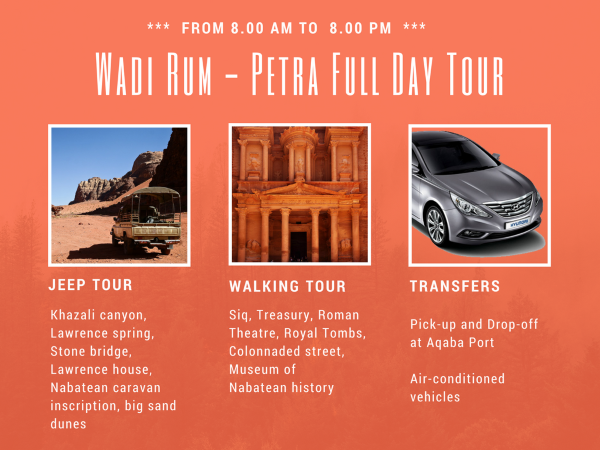 Here are the best Petra day trips tailor made for cruise ship passengers who seek the best value for their money and want to get a unique shore excursion - with an affordable price tag. Below you will find 3 sample itineraries that can be adjusted to your cruise ship's arrival and departure time. Read them through, pick the one that you are interested in and fill in the inquiry form to get a quote from our experienced and enthusiastic tour guide whose top priority is to help you make the most out of your short stay in Jordan. 11.00am Meet your language speaker guide at Petra Visitor center. The Guide shows you the most important places Siq, Treasury, Roman Theatre, Royal Tombs, Colonnaded street, museum ... and talk about the history of the Nabateans. 8.00am Meeting in Aqaba Port - Departing to Wadi Rum. 12.00 noon Meet your language speaker guide at Petra Visitor center. 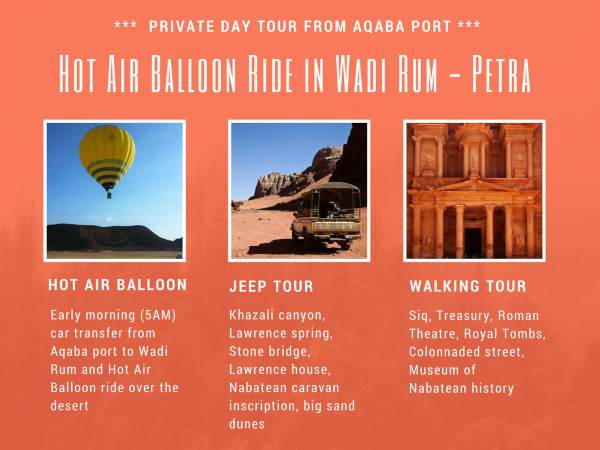 The hot air balloon ride over Wadi Rum desert is only available in the early morning hours so you can only do this tour if your cruise ship arrives in the afternoon/evening, so you spend the night in Aqaba and do the tour the next morning. Note: Alternatively, you can also modify this tour and spend the night in the desert - either in an authentic Bedouin camp or in a luxurious panoramic tent, under a million stars! 05.00am Meeting in Aqaba Port - Departing to Wadi Rum for the Hot Air Balloon ride. I understand that you will use my information to send me the information I requested.